This recipe really showcased the fresh corn, basil, and tomatoes. I served it slightly warm, though my husband preferred it cold the following day. I thought it was delicious either way. To make it gluten-free, substitute gluten free pasta and cheese cubes. 1. Prepare tortellini according to package directions. 2. Meanwhile, process olive oil and next 5 ingredients in a blender until smooth. 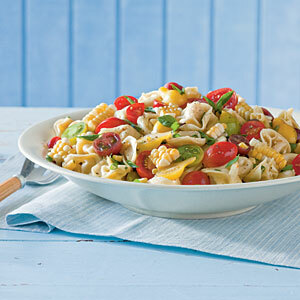 Toss olive oil mixture with hot cooked tortellini, tomatoes, and next 3 ingredients. Season with salt and pepper to taste.